In medieval times, namestones were placed on roadsides to identify town and castle entrances. Now you can revive this ancient tradition with a custom-made namestone for YOUR castle! Each and every stone is different, and a unique work of art! INTERNET-ONLY prices start at $50 and include FREE UPS SHIPPING! 100% made in the USA(0% made in China)... including the paint, sealer, and cardboard box it ships in! In addition to namestones, we also manufacture high-quality memorials, devotionals, cornerstones, anythingstones, pet headstones, businessstones, scripturestones, address namestones, donationstones, quotestones, eventstones, gardenstones, address blocks, and any other engraved stone you can think of! We combine beautiful natural stone and unsurpassed craftsmanship to create unique and cherished keepsakes. High quality natural stone is engraved, painted, and sealed for interior or exterior use. Plant a tree and remember a friend with a lasting memorial plaque, or place one at the scene of your lost one's fatal accident site. Looking for that perfect wedding gift? Commemorate a wedding or other event with a unique gift that is sure to be remembered with one of our eventstones. Open your business in style by hanging up your "shingle"! Check out our preformatted businessstones. Getting ready to pop the question or maybe you already have? Set your deepest feelings in stone with a unique devotional. Thank a donor or benefactor by adding a donationstone to your project. Have your favorite biblical scriptures set in stone like Moses did with a scripturestone. No garden is complete without some stonework- customize your garden with a gardenstone. Animal lovers- Forever remember your deceased dog, cat or other critter for years of faithful companionship with a custom pet headstone. Looking for a birthday gift for that hard to please individual? Why not take one of their "famous sayings" and put in in stone with one of our quotestones. Realtors- Thank a client with a custom-engraved namestone gift! 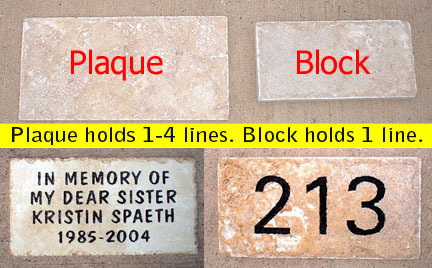 Builders and homeowners- Our rustic preformatted address blocks, address namestones and cornerstones add a unique final touch to your project! Why wait for 3-7 WEEKS? Get your custom stone in 3-7 DAYS with our FAST TURNAROUNDS! Using our standardized ordering process, your engraved stone will arrive by UPS Ground about 3-7 business days after you place your order. Need it faster, like right now? Use our new EXPRESS SERVICE OPTION using FedEx Express to get your stone as soon as 10 AM the day after tomorrow! CLICK HERE for info. We start with a block of marbled, earth-tone Palacio Travertine. Plaque is 16" x 8" x 1/2". Block is 12" x 6" x 1/2". We then tumble the edges to to create a palette for our unique custom-engraved art. Stone palettes are then individually matted with a latex template, and then sandblasted for over 30 minutes at up to 100psi. Then the engraving is carefully spray-painted with black Lithichrome paint- the same long-lasting paint that is used on cemetary gravestones costing thousands of dollars. Then the stone is sealed with a high-quality polyurethane sealer for CENTURIES of beauty! All work is done in-house at our Dallas, TX facility. It's FAST and EASY to order: You type it... and we engrave it! 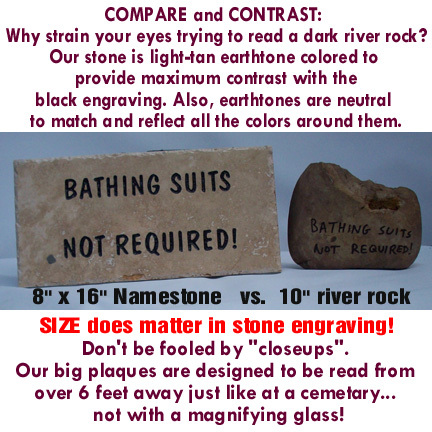 Beware of internet imitators peddling cheap "painted rocks"! Namestones: Stone is sandblasted up to 1/8" deep for full 3-D effect. Imitator: Stone is barely etched on the surface with a computer laser. Namestones: After sandblasting, stone gets 4 coats of primer and professional stone paint, followed by 2 coats of hard, penetrating polyurethane sealer. Imitator: Single coat of cheap epoxy is applied over the laser etching, and then washes off quickly. Why not just pick up a rock and write on it with a sharpie felt tip pen! Namestones are made to last for years! Personalized engraved stone makes a lasting impression on all who see it, and is ideal for enhancing the appearance of your entrance, garden, or patio. Everyone enjoys seeing their name in print! Seeing one's name and/or message cut into stone is even more compelling. These personalized items make great business or personal gifts for any occasion. To send a namestone as a gift, click "Gift" on the order form and add a note to the recipient! Click on any of the links in the left column to order your custom engraved stone today!